A strong southwest wind flow should cover the whole country over the weekend, this is great news for east coast fishers who haven't had their fair share of fishable winds this year. So, the east coast from North Cape to Dunedin should be the place to be. Occasionally we get reports from newsletter subscribers who do not get the pictures with their newsletter. If you receive the newsletter as text and want it with the pictures visit the above link and resubmit. You also need to be online to view the pictures. You may need to hit refresh on your browser to get the latest one. Over the past few weeks it has been good to see that the snapper are still around in good numbers up and down the East coast of the North Shore from North Head through to Tiri Island. Even though there is still a lot of small snapper hanging around, there are also some beauties among them. I use a bottom longline modifiied to use out of my kayak which was kindly set up by Paul's Fishing Kites. It has been working a treat and the results have been tremendous, especially in the shallows off Murry's Bay and Torbay where I have been catching only snapper. The fish average 3lb and, on occasions have been getting up 5 to 6lb. My best lately was a great 16lb snapper a few weeks ago caught on the magic Target Hooks and pilchards for bait. Whole squid is also hot on the menu at the moment with the hook in the top end of the tube leaving tentacles moving naturally in the water. Anyone wanting to kayak fish the East coast over winter with me e-mail me on kiwiscapers@xtra.co.nz or phone on 021 4144719. Best results I have found are on the top of the tide through to half way out and if you can time it to fish on the last hour before dark it doe's not seem to matter what the tide is you just simply load up. For kite fishermen you want to be 400 to 500 meters out at the most and get knowledge of the seabed before fishing off these beaches. There is a fair bit of exposed rock at the moment especially off Murrays and Milford beach. I would recomend you use salted pilchards or squid and good sized peices too! Last weekend was certainly what all west coast kite fishers dream of. Plenty of wind to keep the kites up, good fish in close and conditions just perfect for setting your gear out. Robbie Cullen, our resident kite fisher from Maungaturoto was out at his favorite spot near Glinks Gully on Sunday with his mate Alan. Robbie used his special salted mullet and kahawai for bait and they put out three sets before lunch and caught a total of 21 fish including one school shark. The catch was a mixture of kahawai up to 1.5kg, snapper up to 4kg and five gurnard. The fish were all caught within 800m from shore. With very heavy rain clouds all around them Robbie and Alan decided they had had enough for the day and left the beach just as the weather closed in. Robbie was so pleased with his 4kg snapper he decided he would measure it; it was 57cm long. If you check out the Length to Weight chart on the right you will see the fish was in better than average condition. The attached table gives the average weight of snapper by length. Thousands of fish were measured and weighed to calculate these weights. So if your fish is heavier than the stated weight in the table, it is in above average condition. If it is considerably less it is in spent condition. "The best fishing ever" is how Tony Talbot from the Kite Fishing Club described his day out on Muriwai last Sunday. With no rip or waves to contend with and around 30 knots of wind it was certainly the place to be. Tony and his friend Noel drove more than 20km north of Muriwai Beach to set their gear. Using his Bottom Longline Rig, Tony sent out 25 hooks on the first set and 10 hooks on the second set. Doing short sets of no more than 10 minutes Tony managed to haul in nine snapper, seven kahawai, one shark and six gurnard. All the snapper came in on the second set, only one hook failed to catch a fish. It was an awesome result, the biggest of the snapper weighed in at 7kg, the next biggest was 5.8kg and the remainder were all above 2kg. On the day it was baby squid cut into three pieces that did the business, although Tony reckons anything would have worked on the day. He has promised to show us the photos once these are developed, certainly looking forward to seeing them. Further down the west coast at Kariotahi Beach, David Billings was also using a Bottom Longline Rig and catching plenty of fish. Arriving at the beach before sunrise, David reports there was an incoming tide, flat sea, no rip and a strong offshore wind. The conditions couldn't have been better, it was the perfect day for kitefishing! David ran two sets, the first was baited with fresh mullet and set out to around 1800 metres offshore. Fortunately, after running out of bait on his first set, he managed to score some frozen mullet from another kitefisher further up the beach and used that on the next set. David caught total of 22 fish, eight of which were snapper between two and three kilograms each, plus eight gurnard, two kahawai and four small sharks. David stopped and spoke to several kitefishers as he was leaving the beach and all reported catching good fish. David reports one party kite fishing out from the surf club was bringing in bigger snapper in the three to four kilogram range. By the time David left the beach he estimated there were at least 30 kites out along the coast. Hopefully everyone was having the same results as David managed on the day. Due to the easterlies over the last week or so there has not been much happening on the kite fishing scene on the east coast. Those using boats seem to be getting onto some good fish. 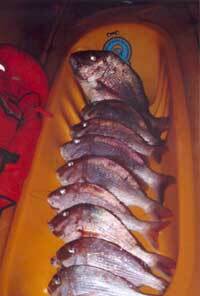 Kathy from Bay Bait and Tackle in Whitianga reports snapper are still coming in on a regular basis. One charter boat operator took a party out on Tuesday and the punters came home with a great load of fish, the best being a 14lb snapper. The kingfish have moved out to the deeper water but they are in very good condition and size. There have been very few reports of fishing close in so anyone with any information would be welcome to contact us at fishing reports with any details. A snag has been reported off Red Beach, Auckland. It is to the left of the boat ramp. 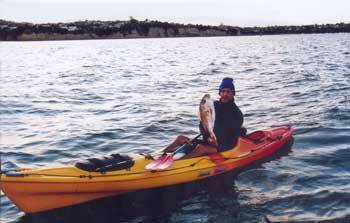 Barrie McKay reported by phone this week on his fishing success at Mokau on Saturday. Barrie set his Flexiwing Rig 1000metres offshore in very strong easterlies and caught only one kahawai. Deciding that the Flexiwing Kite was too powerful on the day for the few hooks he was setting he changed to his Pocket Sled Rig. This was much more manageable-and successful. Setting only three hooks 400 metres offshore Barrie's next two sets caught four large gurnard, (2 per set). Well this was the first weekend for a long while we had no one on our beach, a north easterly ranging up to 20 knots made it impossible to set a Kite or Kontiki from the Beach. Not even a solitary surfcaster turned up. On a brighter note we had word from the commercial cray boys from Flat Point that the crayfish have arrived. The crays have also arrived here at Porangahau, so if these northerly winds keep up this weekend recreational fishers might do better setting cray pots off the rocks. If you are interested in seeing Pauls Kites Video, don't forget we are showing it on Wednesday night at 6pm. Gold coin donation to our local School. Also with the Whitebait season just around the corner it might be time to check our Whitebait Nets as well as a full range of Pauls Kites, Longlines and associated equipment. I went fishing about one kilometre north of Rimmer Rd just before dusk on Saturday with the 25 hook Bottom Longline Rig. We caught 14 good snapper up to 8 pounds. We also caught six good sized gurnard. It was hard work pulling the kite in, luckily I had three helpers. With such good fishing I dont know whether to keep it a secret or not!!! I am a member of the Weymouth Boating Club. My wife and I enjoyed the talk and also the information that Paul of Paul's Fishing Kites gave to us when he came to our club last year at our A.G.M. We fish from a boat, mainly in the Rangitoto Channel area, where Paul's Sliding Rig works very well. We have caught snapper, kahawai, trevally and just recently added john dory to the list. I have half shares in one of Paul's Boat Longlines but have yet to use it at our spot as we always come home with fish anyway. We don't take too many fish at once as we like to go out in the boat, and this gives us a reason to go out fishing. Once again thank-you for some great information both in your shop and now on your web page. We hope to grow the fishing report newsletter subscriber numbers into the thousands so that we can give good coverage to all areas around New Zealand and cover more methods such as surfcasting and fishing from boats with rods or longlines. If you already enjoy the newsletter or want more coverage of your area you can help by simply letting your mates know about this newsletter. You can help us make this a great newsletter by sending in your fishing reports to Fishing Reports Please include your name, where and when you were fishing, rig or method you use, wind conditions, bait and what you caught. It is also important to know where the fish are not biting so even if you catch little or nothing send the report in. This helps everyone maximise their fishing time and makes it that much more enjoyable for all of us.